We are once again back home and first of all we would like to say a BIG THANKS again for being so kind and nice with us and of course to help us plan such a wonderful holiday which we really enjoyed and I'm sure that we would never forget!! decided that we should still go on the gondola and we were glad we did because up there the weather was beautiful and the little snow that was there was so nice and shiny and we all loved it! Since there weren't any people around yet it was so quite and peaceful! Then we made a stop at Johnston Canyon. We only walked till the Lower Falls (due to the limited time we had), but the weather was brilliant so it was nice to walk! 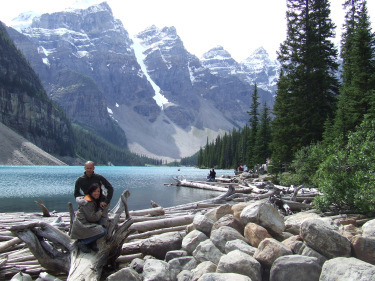 Then off we went to Lake Louise and Moraine Lake which are also SOO nice - the views you see are so picturesque and obviously not to be missed!! beautiful! The colour of the lake is so nice and unique! Then back on the road to Athabasca Glacier and the Icefield Centre. We arrived just in time for the last Ice Explorer tour!! Ray really loved it there (he loves the ice/snow!!) We even brought an empty bottle to capture some ancient waters to drink! Due to the time, we had to skip Athabasca Falls and made our way on to Jasper!! When we arrived in Jasper we entered the village sort of from the back side and didn't see the main road. We were kind of saying, "What's all about this place!!". In the evening we were so tired that we didn't bother to go around much and ate at the hotel. But then the day after when we woke up, we thought to go round Jasper and then we all liked it so much!! back to see them (since you Marcel had emphasized not to miss them) and we're glad we did because it's so nice there! From there we drove to beautiful Maligne Lake. When we arrived it started raining and unfortunately during the boat trip the weather wasn't very nice. After the boat trip we went for a coffee! By the time we took the coffee the sun had come out and when Ray saw the canoes, he thought we should go with one on the lake. Our daughter wasn't so enthusiastic about the idea at first, but then once we were out on the lake, it was so much fun! And we were very lucky too because for the 45 minutes we were out on the canoe, it was so sunny but once we returned back to the car, it started raining again! On our way back to Jasper, we went to see Lake Annette and Lake Edith too! The day after, we had to leave the car at 11.30 am, so in the morning we went for a drive to Patricia and Pyramid Lake. We spent the rest of the time strolling in Jasper! We weren't very lucky with animals though! We saw some elk and deer but that was it! We arrived in Vancouver at around 8.00am and went to our hotel. There we thought that we should just go to Grouse Mountain, since it was such a nice day and indeed that's what we did. We stayed up there till nearly 4.30pm!! My husband was a bit down because he was missing the Rockies so much and he was dreading that we didn't stay there longer and then drive our way down to Vancouver....!!!! But at least it was nice on Grouse Mountain with all the shows and the grizzly bears. And as I said, it was lovely weather too! The day after we had a Vancouver City tour with the Capilano Suspension Bridge!! We loved Capilano and we were sorry that we had only 1 hour for it because it's so nice there! But of course we managed to see most of it! And it was good that we took the city tour too because we managed to see many things in Vancouver which we wouldn't have seen if we hadn't taken that tour! On the third day we had no plans so we went to Deep Cove, a nice quiet place on the other side of Vancouver (took the seabus)! Great! The day after that we spent the morning strolling in Vancouver (went to Gastown and round the roads of Vancouver) and at around noon we had to check out. We went to the port and headed on our way to our Alaskan Cruise! went on a cruise, so we enjoyed it and it was nice to have some relaxed days after the hectic (but nice) ones we had before!! We went whale watching and were quite lucky with that! It was so nice seeing them so close! should head back to the airport and wait there! And so that's what we did! The last 2 hours I couldn't stand the tiredness anymore! I was so sleepy! But we had a good flight back home! Well, on the whole that's more or less what we did during our wonderful holiday! Regarding our itinerary: it was organised - we were very happy with everything! We found the vouchers quite comfortable because we just had to stop at every place and just present the voucher and it was so organised! Even the fact that you sort of have your mind at rest with the money because most of the things were already paid for so we didn't have to spend much money there on excursions and lodging but could save it for something else! Wow… Sounds like a great trip to me. I actually do love these sorts of adventures and thrilling trips and was actually looking for some in the nearby areas. I think it would be a great trip to make from Vancouver. Join in and write your own page! It's easy to do. How? Simply click here to return to Great Tours - Tried and True by Our Visitors!.